Pasco High Courtyard – Spring Engineering, Inc. In 2009, Spring Engineering, Inc. was tasked with upgrading the Pasco High School campus courtyard. Over the years of continual operation, the existing courtyard had become an uninviting space that contained worn walking paths, dilapidated benches and railings and had lost its sense of place. 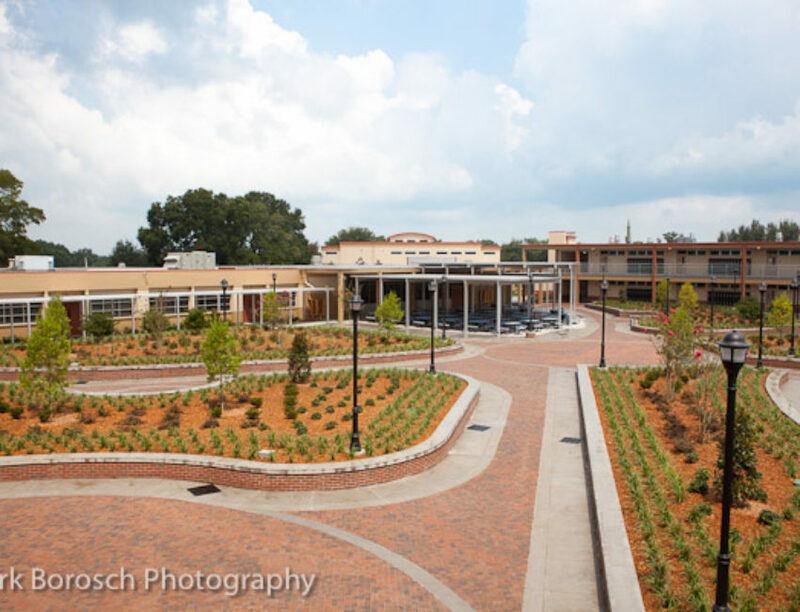 To restore the courtyard and create an inviting usable space, our design team implemented the use of raised brick, landscape planters to control traffic flow between buildings which also serve as seating for students. Curved pedestrian walkways which connect the surrounding buildings are clad with brick pavers and lined with lush landscaping. Also included is a covered outdoor dining area that extends from the cafeteria and projects into the courtyard which allows students to eat outside on pleasant days. The scope of work provided for this project included but was not limited to: addressing existing site conditions, site design, 3D renderings and new construction.